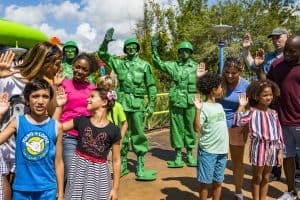 Since its arrival on June 30, Toy Story Land has been incredibly popular. That’s no surprise, though, considering it’s a celebration of one of the most beloved movie franchises. But given its popularity, you don’t want to miss out on any fun, and you’ll want to make sure you maximize your experience, too. So before you shrink to the size of a “child’s play-thing”, here are 10 things you need to know about it. Upon entering Toy Story Land, you’ll actually be stepping foot in Andy’s “backyard”, where the attention to detail is staggering. As you explore, you’ll discover larger-than-life character models, otherwise normal-sized objects and even Andy’s now-giant footprints on the ground! To make the most out of these truly unique photo opportunities, PhotoPass and Memory Maker will help make your collection go “to infinity and beyond”! 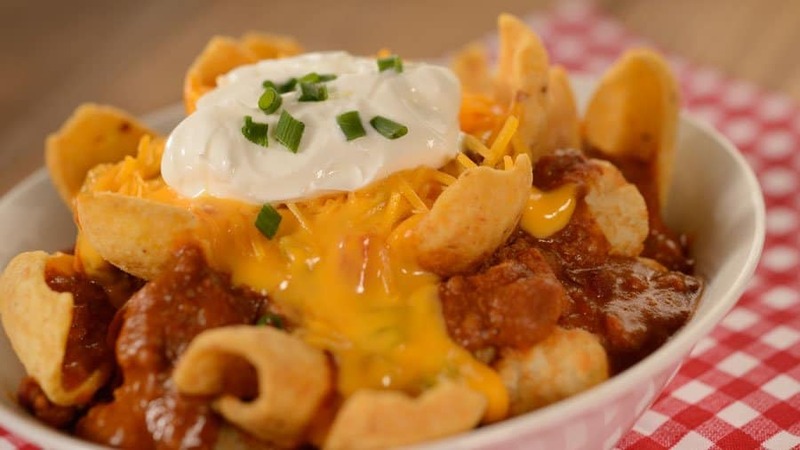 Woody’s Lunch Box is a wonderfully-decorated restaurant where the food is incredible. But while the embossed pictures on the inside of the lunch box lid (the restaurant’s overhang) are awesome, there isn’t “Lotso” fun to be had waiting in line. Don’t worry, though – you can pre-order your food (and pre-pay) with the My Disney Experience app’s mobile order feature! Alien Swirling Saucers is a space-themed ride of a spinning nature, and with each instrumental song that accompanies it comes a different “lights package”. So in order to experience the ride in its most galactic form, a night-time visit is a must. It’s fair to say that this ride is so uplifting it will pick you up – almost like a “claw”! Just like in the Toy Story movies, the Green Army Patrol is always… well, on patrol! They’re pretty well camouflaged, though, so keep your potato-eyes peeled. These guys are a wonderful addition to Toy Story Land and help make it that little bit more immersive. Be quick in grabbing a selfie or a photo when you spot them, and remember – “a Toy Story fan never leaves a soldier behind”! Toy Story Mania! might no longer be the only such themed attraction in Walt Disney World Resort (not forgetting Buzz Lightyear’s Space Ranger Spin), but it still remains the best. In fact, it’s why Disney Imagineers decided it would best serve the entrance to its respective land. If you’re a Disney Resort Hotel guest, take advantage of Extra Magic Hours to enjoy this hugely-popular ride. 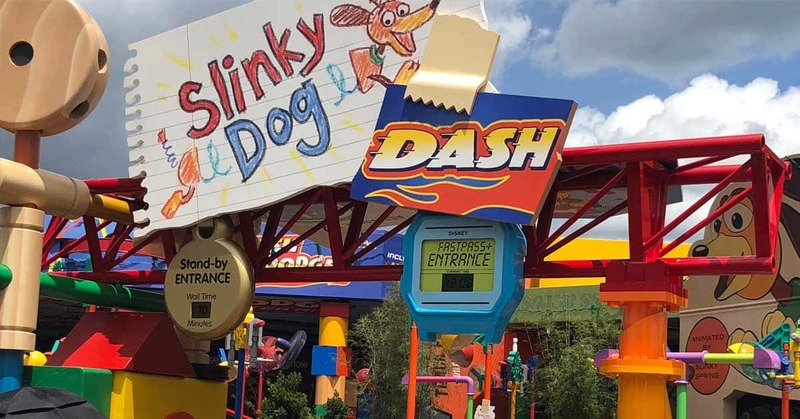 Family-friendly attraction Slinky Dog Dash might seem like your average roller coaster, but it’s actually the only one with a double-launch in Walt Disney World Resort. This means that you’ll get twice the action in one ride – while at the same time getting twice the length of Slinky! 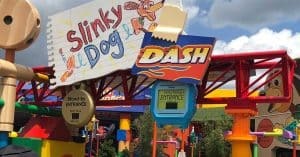 Just try not to sit at the very front as Slinky’s head may block what is an otherwise awesome view of the track and the land. Then you’re free to “fall with style”! 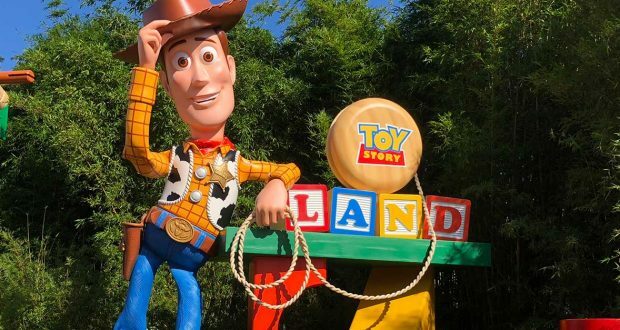 At Toy Story Land, look out for attraction-themed mementos, as well as adorable backpacks and apparel as part of the 2018 opening of Toy Story Land (grab them while they’re available this summer!). Fan of themed Mickey Ears? 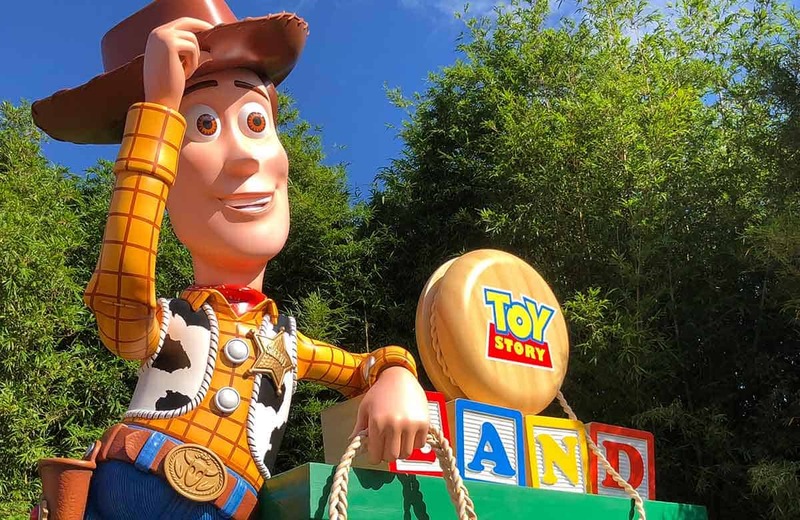 Don’t worry – Toy Story Land has your ears covered, too! Make sure you purchase a MagicBand (free to Disney Resort Hotel guests) and start filling your own toy box. Besides “a whole new world” of Disney music and more, with the Play Disney Parks mobile app you can collect Magical Achievements by simply enjoying rides like Toy Story Mania! But you can also “extend” attractions while waiting in line with games like Toy Story Mania!’s Playset Party. The app is free to download for iOS and Android phones, and as it encourages you to interact with those in your group, you could say “you’ve got a friend” and more in this app! Unlike in the movies, Woody, Jessie and Buzz are exactly where they’re supposed to be. At times you’ll see them wandering around, but if you want photos, use the My Disney Experience app to keep tabs on their whereabouts (although you’ll often find Woody near the Toy Story Mania! entrance). Be sure to get autographs, too – just don’t ask them to write your name on the sole of their boots, or vice versa! Now that you’ve been completely briefed by Star Command, you’re free to “roundup” all these tips and “play nice”!